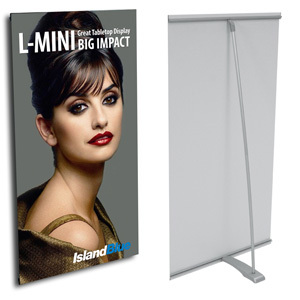 The L-Mini Table Top Banner Stand is a compact tensioning banner stand that fits on any table top. It holds a vinyl 14.20"W x 27.25"H professionally printed graphic which is pulled taught by a pole connected to the hardware base. Lightweight, easy to assemble. Print Size: 14.25" x 26.75"
Visual Size (display):14.25" x 26.75"
Ready to print? Take advantage of our online ordering! Like to get some more information? Feel free to contact us via the form below and one of our representatives will be happy to get back to you to discuss your specific project.